Dentrix Ascend provides an online portal where patients can complete forms prior to or during their visits. 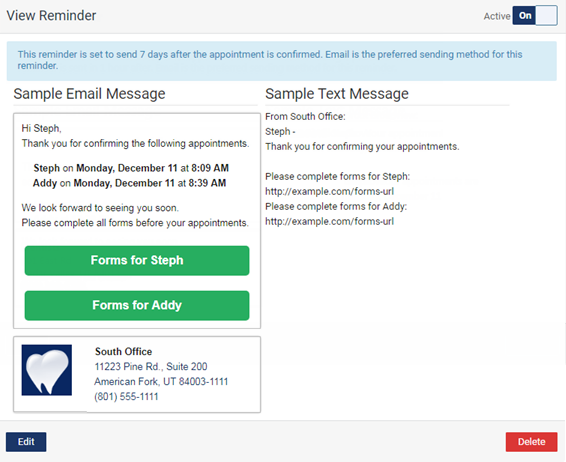 Bulk automated appointment reminders - Each appointment reminder that Dentrix Ascend sends out automatically by email and text message can include a button (with email messages) or a link (with text messages) that a patient can use to open the portal where he or she can complete online forms. Individual manual request - You can manually send an email or text message with a link to a patient, such as when a patient accidentally deletes the text message for his or her appointment reminder. You can also have a patient complete forms in your office on a mobile device connected to the patient's online portal, such as when a patient shows up at the office without having completed the necessary forms. 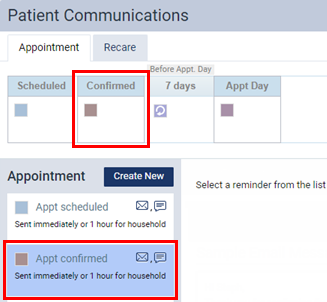 As part of your patient communication campaign for appointment reminders, create an Appt confirmed appointment reminder, which is based on the Appointment Confirmed Date event. An email message will have a button for each related patient on that reminder. A text message will have a link for each related patient on that reminder. On a patient's Overview page, the Patient Forms box displays the patient forms that have been completed and those that are due. Click (or tap) Request Forms. While viewing a patient's appointment, position your pointer over (or tap) Forms. The pop-up box that appears displays the patient forms that have been completed and those that are due. Click (or tap) either a form that has a Due Now status or Request Forms. While confirming a patient's appointment, position your pointer over (or tap) Forms. The pop-up box that appears displays the patient forms that have been completed and those that are due. Click (or tap) either a form that has a Due Now status or Request Forms. The Request Forms dialog box appears. To send the portal link to a mobile phone number, select the desired number from the list, and then click (or tap) Text Link. This button is available only if the patient has a mobile phone number entered in his or her record. The mobile phone numbers of the patient and his or her primary contact are available for selection. To send the portal link to an email address, select the desired address from the list, and then click (or tap) Email Link. This button is available only if the patient has an email address entered in his or her record. The email addresses of the patient and his or her primary contact are available for selection. To copy the portal link to the Window Clipboard, click (or tap) Copy Link. You can then paste the link in a document or email message for the patient. Note: The link will expire two weeks from the date that it was generated (the date you opened the Request Forms dialog box). After that, you must generate a new link if the patient still has not used the original link that you provided. Tip: To open the patient's portal on another tab of your Web browser (for instance, if you are opening it on a practice-owned mobile device that the patient can use to complete forms in the office; be sure to close any other Dentrix Ascend tabs before giving the device to the patient), you can click (or tap) the Click here to access forms link. 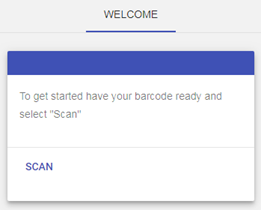 Either print the QR code by clicking (or tapping) Print QR Code, or leave the QR code on-screen. Using the Web browser on a practice-owned mobile device, navigate to https://bookit.dentrixascend.com/v1/view/kiosk/dashboard.html. Point the mobile device's camera at the QR code (printed or on-screen), and then click (or tap) SCAN. Since using a mobile device to scan a QR Code to open a patient's portal registers that mobile device with Dentrix Ascend, you should use a mobile device that is owned by your practice. 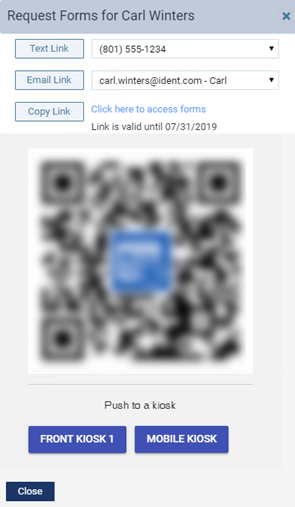 Using a QR code requires that your mobile device meet the following specifications: for an Apple device, iOS 11 and the Safari browser; or for an Android device, Android 4 or newer and the Chrome browser.